Kansas is home to a variety of mini golf courses to practice your putt and make some memories with the family. Whether you’re looking for an all-out gaming complex complete with an arcade or a traditional and timeless outdoor course, Kansas has it. Here are the 10 best mini golf courses in the state. Depending on the weather you can play 18 holes of miniature golf at Tumbleweed Turf located at Hardrock Lanes in Garden City. All ages are encouraged to grab a putter and hit the ball! Inside this wonderful city park, you’ll not only find the Ralph Mitchell Zoo, but a fun, family-friendly mini golf course! This is definitely one you’ll need to try. The Lodge in Baldwin City has some great family fun entertainment and an enjoyable nine-hole miniature golf course. The Lodge has lots to offer guests and the miniature golf course is open to the public daily. At Precision Valley Golf & Bike Center in Hays there is a really cool 18-hole miniature golf course. This course is challenging, but still fun and family-friendly. The kids will love this spot. 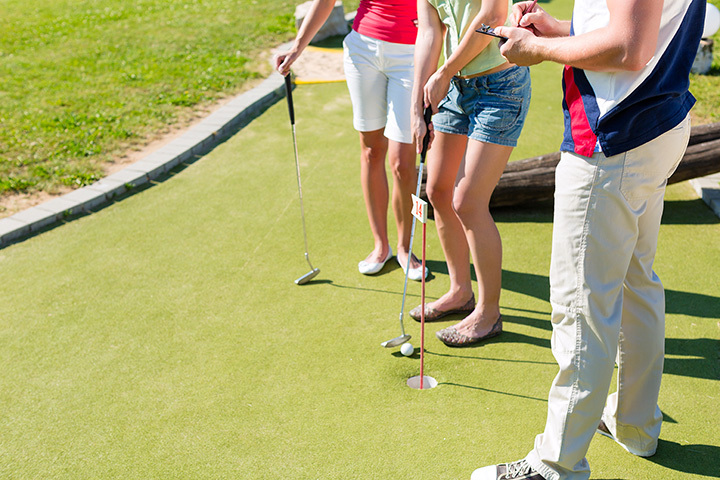 Putt A Round Driving Range & Miniature Golf in Junction City is fun for the whole family! The course can be easy and challenging, and the staff is happy to help you have fun. Enjoy playing a round of miniature golf at All Star in Wichita. This 18-hole mini course is wide open and guarantees loads of fun. Great Life Safari Miniature Golf in Topeka is a unique course to test your putting skills. In between holes you can observe the wildlife on the course. Lots and lots of fun at Jumpin Joes Mini Golf in Salina. This 18-hole course has twists, turns and surprises on every hole. Epic Fun in Lawrence has the best mini golf course around. There are lots of activities to do but don’t leave until you have played a round of golf.